Still think Segways are the hottest thing in personal transportation since the bicycle? Well, the Segway’s now old school. 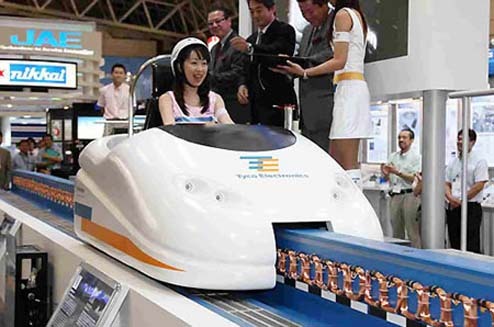 Tyco and Gakken have teamed up to create this maglev personal transportation system that lets the rider glide on air…. sorta. In all truth, it’s actually held above the rail by magnetic levitation. However, in a race between segways and the magnetic technology, maglev systems wins hands down. The record speed for a full maglev train is 361mph, something a Segway can only dream of. The use of something like this? I could see it being used at some factory type of setting where things are spread out over a large area. Maybe even amusement parks or malls for the disabled. This could be the new wheelchair! Whatever its use, its still very cool.